The U.S. Department of Energy has selected a Fraunhofer CSE-led team to carry out a $3.5M research project to design, develop, and deploy a sustainable and holistic system for grid integration of solar photovoltaic (PV), energy storage, and facility load management at the utility distribution scale in Massachusetts. The system is planned to be completed within three years and demonstrated in Massachusetts for at least one year. Fraunhofer CSE, with National Grid, the Massachusetts Clean Energy Center (MassCEC), and other industry partners, will match the award and put $3.5M towards the project. Fraunhofer CSE has won the U.S. Department of Energy’s SHINES award on grid management research with its project “SunDial”. Currently, one of the biggest challenges facing utilities is how to integrate large quantities of PV production with the electric grid without compromising power reliability and quality. The Fraunhofer CSE-led project, called “SunDial,” will create a management system to mitigate the intermittency of electricity. 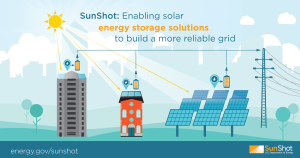 SunDial will tightly integrate PV, energy storage, and aggregated facility load management to actively manage net system power flows to and from the feeder – regardless of whether these individual components are co-located at the same site, or distributed at different sites. Working together, these systems will address the two greatest issues currently inhibiting high-penetration of PV on the grid – the intermittency of PV generation and the mismatch between electric loads and electric generation. “This project builds on Fraunhofer CSE’s work on solar PV, grid integration of renewables, and building load management, including ‘real-world’ integration with utilities, municipalities, and other stakeholders involved in integrating PV and other renewables into the grid,” states Dr. Christian Hoepfner, Center Director of Fraunhofer CSE. The project team, led by Fraunhofer CSE, will create an open-source framework that builds upon existing interoperability data models to facilitate integration among PV plant developers, load aggregators, independent system operators and utilities across a range of use cases and business models. Read more about all SHINES projects in the U.S. Department of Energy’s press release. This blog post was updated on January 22, 2016.